An internationally famous bird sanctuary and home to grey and common seals. Daily trips leave from Morston Quay (times vary according to tide) on red and white boats, Morston ferry and Four Sisters. Timetable essential to plan trip, or telephone for details. Tickets to be collected from the Anchor pub, Morston (01263) 740791. 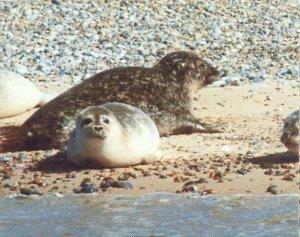 Visit our website www.sealtrips.co.uk for further information or call 01263 740791 for human contact!! Food available from pub when picking up tickets. Boats run 7 days a week. Timetables and tickets available from the Anchor Public House. Trips vary with tides. Timetables and tickets from The Anchor Pub, Morston, NR25 7AA. Booking in advance strongly recommended. Morston is 1 mile west of Blakeney. Anchor pub is on the A149 coast road. From Sheringham station it is 10 miles to Temple Seal Trips.